Food Wishes Video Recipes: What Do You Know About Peach Cobbler? I've never made a peach cobbler. I've made peach crumbles, peach crisps, peach tarts, peach pies, and peach parfaits, but not one single cobbler. I've been doing some research for an upcoming video, and I'm leaning towards the classic southern style where the batter bakes up through a buttery layer of peaches and juice to form a beautifully browned crust over the top. I literally just made myself hungry typing that sentence! 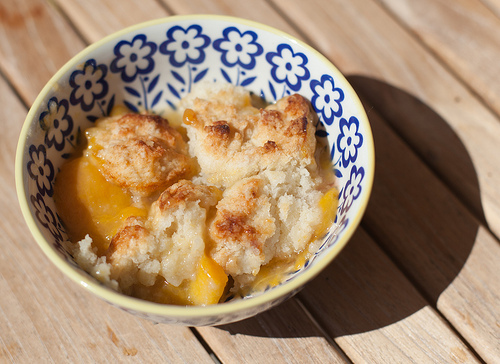 If you have any "to die for" peach cobbler recipes, please pass them along! Thanks and stay tuned! I only know two things about peach cobbler: My granny makes a mean one, and it is ALWAYS about the crust. I am more of a crisp fan than a cobbler but when I make cobbler I always use fresh peaches, a good quality buttermilk, a mix of white and brown sugar and real butter. I have never seen the southern version you describe John (something to do with being Canadian perhaps) but eagerly await whichever recipe you try - maybe you can do different types and compare? The traditional cobbler I grew up with, but have never made myself for some reason, ALWAYS had a biscuit topping. Made with Niagara peaches fresh off the tree it was a simple yet absolutely yummy experience. Only peach cobbler I ever made was in the Boy Scouts. Canned peaches, Bisquick, and a Dutch oven over hot coals. Surprisingly good. It wasn't "to die for," but the technique is solid. I'm sure if we used fresh, high-quality ingredients it would've been something special. I always thought a cobbler had scone dough on top (biscuit for you Americans, I'm from Australia). Now Peach Pan Dowdy - *there's* one of my favourite American recipes. Also ice cream is good, or cold vanilla custard. What do I know about a peach cobbler? The hardest thing is getting the peaches to stay on your feet. The only thing I know about ol' peach cobbler is that the Salt Lick has the best. Place fruit in a 9 x 13 inch baking pan (for a thicker cobbler use a 9x9). Combine ½ cup sugar and water and pour over fruit. Sprinkle spices over fruit. Mix egg, salt, baking powder, sugar, and flour together. Spread over fruit. Pour butter over top. Bake 30 minutes or until golden brown. Best is cooled about 30 minutes and served slightly warm. Not exactly southern traditional but our family favorite. the best peach cobbler is a blackberry cobbler with vanilla ice cream. The only southern peach cobbler I've ever had was made by an 80 year old Central Texas native, who used fresh peaches, too much sugar for my taste, and cooked them down to nearly half. Then she mixed dumplings like I make for Chicken & Dumplings, from all purpose flour, an egg and canola oil, rolled them to about 1/8 inch, floured them well and cut them 1 inch by 3 inches, and layered them into a pie dish. She poured the fruit mixture over the dumplings, sprinkled with more sugar and a pinch of nutmeg, and baked it until the dumplings that rose to the top were medium brown and crispy. They were too sweet for my taste, but she loved them, and swore they were the only way to make cobbler. Everything else was something else, not cobbler, she'd insist. I'm looking forward to seeing yours! Thanks to everyone for the ideas and suggestions!! We would visit my Grandmother in Arkansas frequently who made her cobbler in a 13 x 9 Pyrex dish. she used fresh peaches with a little sugar and covered it with a lattice pie crust. All of this was done without a single measuring cup or measuring spoon. I think she used lard in the crust? It was off the charts delicious with a big scoop of ice cream. Put on fruit by spoonfuls. Sprinkle with sugar and cinnamon, and/or nuts. Bake 350° for 45 minutes. Definitely a family favorite!!! I'm from Texas and I enjoy this cobbler so much. My coworker's wife makes this and he gave me the recipe. I believe this is what you're talking about chef. mix flour, sugar and buttermilk until smooth but not doughy. melt margarine and pour into baking dish. Pour dour mix on top of margarine, then add peaches. sprinkle with cinnamon. Bake at 350 for 30min until top is brown but not dried out. Place oven rack in lower middle position. Pre-heat oven to 350˚. Put butter in a 13 x 9 inch baking pan and place in the oven to melt. Whisk flour, 1 ½ cups of sugar, baking powder, and salt in a bowl. Whisk in milk and ½ teaspoon extract until smooth. Toss peaches with remaining extract and 1 Tablespoon sugar. When butter has melted, remove pan from oven. Pour batter into pan. Arrange fruit on top of batter. Bake until batter turns golden brown, 45 to 50 minutes. Serve warm or at room temperature. This is buttery and slightly chewy. My favorite cobbler ever. Enjoy! I know my mom's aunt makes the best peach cobbler I have ever placed on my taste buds. I told her she can't make any for Thanksgiving unless she gets her recipe. I can't wait to see what you come up with!